Their feisty chattering and acrobatic movements might inspire laughter and smiles, but for people who garden, and find their tomatoes chewed on and beds dug up, bushy tailed little squirrels are nothing but a source of frustration coupled with a fervent desire to keep them out of the garden. Squirrels are known for gobbling birdseed and nibbling nuts, but they also enjoy feasting on things like tree buds, leaves, flowers, berries, fruits, and seedlings. Squirrels, like the rest of their rodent family, have incisor teeth that are long and never stop growing. When they gnaw on stuff all of the time, it tends to keep those teeth a bit shorter. Squirrels are known to create all sorts of damage in gardens. Squirrels, except for flying squirrels, are active during the day. Here are a few signs that will let you know that they have been in your garden. Shallow holes in the planting beds. 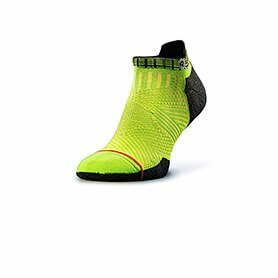 These won’t be huge, they will be about the size of a golf ball or smaller. 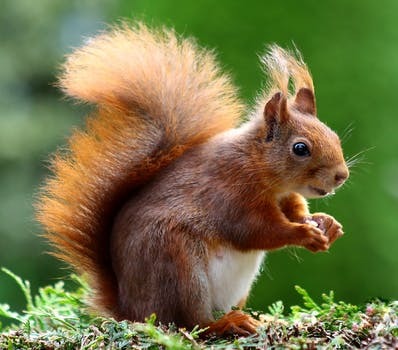 Seedbeds that have been freshly planted are a magnet for squirrels because they love to dig up and eat those seeds. Missing fruit and/or bite marks. 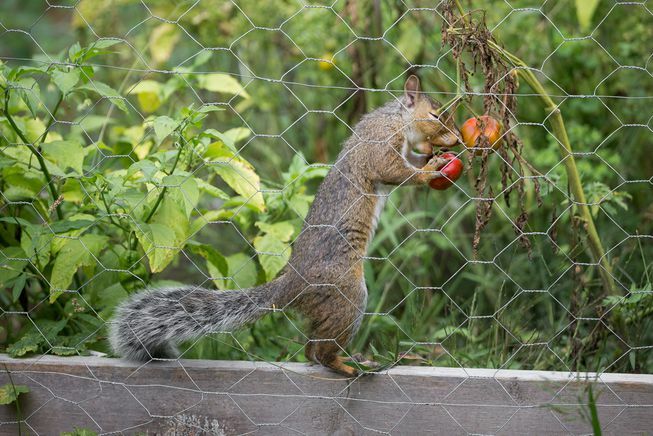 Squirrels have been known to eat part of tomatoes and leave the rest for you. If they are really hungry though, they will eat the whole thing. Other faves for squirrels include eggplants, cucumbers, squash, and beans. When plants go missing. Sure, you might find the remnants of a seedling or two on the ground, but most of the time, they will just vanish. Squirrels do the same things with leaves from perennial plants. Seed heads that have been nibbled on. Squirrels like to gnaw on those ripening, flat seed heads from the edges on the outside and work their way in. They are particularly drawn to sunflowers. Digging in containers. If you notice that your pots of flowers, herbs, and veggies are always being dug into, the culprit just might be a squirrel. Sometimes squirrels will unearth the younger potted plants in an effort to bury nuts for the winter. Flowers that are partially eaten. Squirrels tend to like the blooms of daisies but have been known to eat other types of flowers too. If you come across daisies that are missing half of the petals and most of the disk in the center, that is a pretty good indicator that you have a squirrel problem in your garden. You know, the best way to be sure that you are, in fact, dealing with squirrels, is to catch them in the garden. If you have spotted any of the signs listed above, attempt to keep a better eye on your garden when you are at home to see if you can spot them. 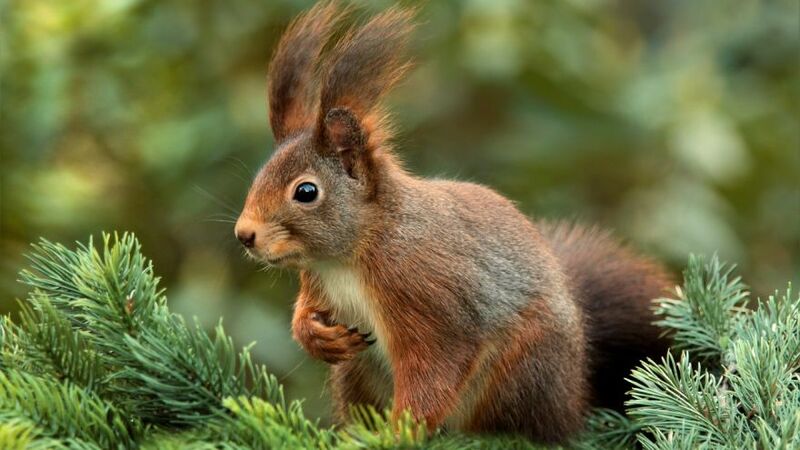 In various areas, squirrels can be as common as the trees. This means that you can attempt to keep them from your yard, but it tends to work better, and it is more practical, to outsmart them. Here are a few strategies meant to keep squirrels from tearing up your garden, but try to remember that what might work for one squirrel might not do the trick for others. For the best results, you should use a few of the tactics simultaneously. Get rid of what they are attracted to. The smell and sight of seeds, fruits, and nuts that have fallen can mean squirrels come to eat them. Clean up these things from underneath bird feeders and trees. Be sure that the lids to your trash cans fit tightly to keep those pesky squirrels from digging for goodies in the garbage. Repel them. If you do a quick online search, you will be able to find quite a few recipes for squirrel repellents. Some of them even feature capsaicin, which is what makes hot peppers hot. Others might include vinegar or peppermint oil, or even a combination of the two. Gardeners have reported varying degrees of success with these things. You will have to reapply them every time it rains, and make sure that you don’t spray the parts of the plants that you will be eating. You can also find commercial sprays and repellent granules. Oh, and make sure that you stay upwind of whatever you are spraying to avoid it getting in your mouth, nose, or eyes. Distract them. You might consider setting up a few decoy food areas that feature some of the things that squirrels go crazy for, like feed corn, sunflower seeds, and even peanuts. Do this in a corner of your yard that is isolated and well away from your edible crops and planting beds. Gardeners have even been known to plant a tomato plant or two near the squirrel area just for the squirrels. Be sure that there is a source of water for the squirrels in their spot. One thing to bear in mind is that other critters might also be attracted to the squirrel area, so weigh the pros and cons before you do this. Scare the squirrels. Cats or dogs in your yard can scare your squirrels and keep them from doing harm in your yard. You can train dogs to chase squirrels, and once you do that, you won’t have too many problems with the squirrels. If you don’t happen to have a pet, you can buy vials of what is known as “predator pee” to put in your garden. This is the pee of animals like tigers and wolves. The aroma terrifies all sorts of animals, even squirrels, deer, and rabbits. With this spray on type of urine, you will need to reapply it each time it rains. Sprinklers that are motion activated might also work for a while, but don’t completely rely on them. For areas that are newly planted, you might hang old CDs, recycled pie tins, or use pinwheels to add a bit of movement and noise to the area. This might work until your plants have grown larger than seedlings, which is when most squirrels typically lose interest in the plants… unless you happen to be growing tomatoes. Exclude them. If you want to keep the squirrels away from your beds and plants, you might try covering them with a cage. Things like summer weight row covers, chicken wire, some plastic bird netting,or even hardware cloth will all provide protection that is effective. If you want to guard a single plant, you can make a cage using chicken wire or hardware cloth topped with a bit of plastic bird netting. Just use a few clothespins to hold the netting securely in place. Protect the harvest. You might want to wrap the individual vegetables and fruits, such as eggplant, tomatoes, and other types of vegetables and/or fruits in little pieces of bird netting. Because squirrels are more interested in stealing and snacking on tomatoes that are just ripening, you can ignore the ones that are still green. Cover the bare soil. 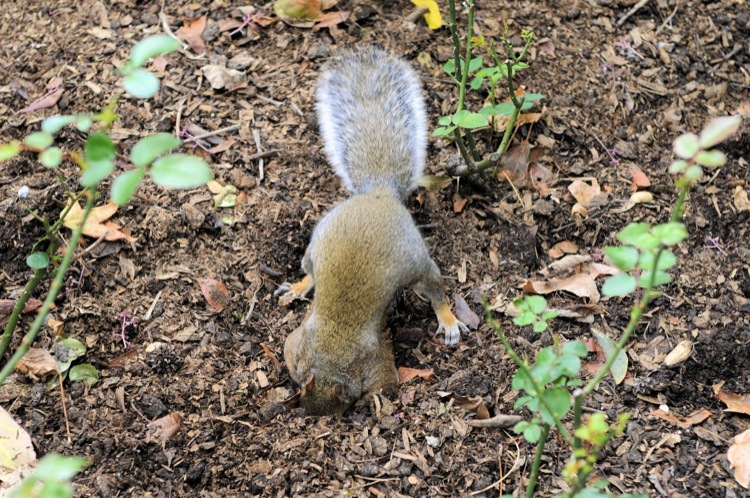 A lot of gardeners attempt to discourage the squirrels when it comes to digging by mulching any of the soil that is bare in seed beds as well as around seedlings that have been planted recently. Invite a few predators. Several species of owls, and a few hawks tend to prey on squirrels. You might want to research which ones are native to your area. You might even want to learn what you can do to attract them. Quite a few gardeners choose to trap and then release the squirrels. This might decrease the local population momentarily, but new squirrels will soon move into the territory as soon as it is unoccupied. Also, squirrels are thought of as a game species in many areas of the country and this means that there are laws to protect them. This also means that even live trapping can be illegal. Before you get yourself into trouble, check with the Department of Fish and Wildlife in your area before you try it. Cages. Squirrels can be a bit resourceful at times, which means that when you want to outsmart them, you have to be more than a bit shrewd yourself. We mention cages for your crops earlier. Now, we are going to get a bit more into that for a minute. These cages are simple to make and a good DIY project that you can even get your kids involved with. 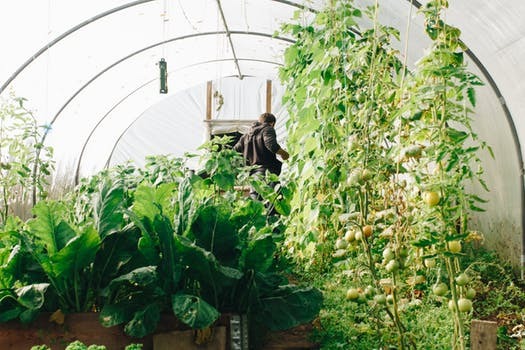 Depending on how your garden is laid out, and how many tomato, or any other type of vegetable plants you are growing, you can either build a cage for each individual plant or a larger cage to protect the entire bed. For example, if you have a 6’ by 6’ garden plot, you can cage that entire area. There is one thing you might want to keep in mind when it comes to caging your veggies. Tomatoes that you will be growing in a cage that has a roof will need to be determinate tomatoes. This type of tomato, aka bush tomatoes, will only grow to a specified height – typically smaller than 4 feet, and the tomatoes all tend to ripen near or at the same time. If you will be caging individual plants, buy 6 feet of hardware cloth that is wire. Form the cloth into a circular shape. Then, you will want to use a pair of pliers to loop each of the strands on the end that is cut into the individual wire squares that are on the opposite end. Once they are in place, bend them before securing them with the pliers to those squares so that the new ‘fence’ will remain in the shape of a circle. Put that fence on the ground surrounding your tomato seedling. Drive a stake into your ground right beside the fence and then secure the fence right to your stake in order to keep it in place. Once you have done all of that, get a piece of bird netting and place it right over the cage you made from the hardware cloth and then secure it using twist ties, zip ties, or even clothespins. Mix those buggers a cocktail. There are gardeners who swear by hot tea made from red peppers. You can easily mix a batch up and spray it right around the edges of your garden and the leaves of whatever you have planted. People who have made this brew will swear to you that any unwanted critters won’t go anywhere near their precious tomatoes. That being said, this is one of those things that needs to come with a warning. Do not let the mixture get anywhere near your mouth or eyes, and don’t let it touch your skin. Sniffing it might also be a bad idea. The main ingredient, capsaicin, can lead to severe irritation if it comes into contact with your skin or any orifice. If you want to reuse any of the containers that you might have used in making the tea, you should mark them clearly and don’t leave them where children can get them. Begin by putting on some rubber gloves. The kind you can get to wash the dishes should suffice. Get 4 fresh cayenne peppers and cut off the tops. Throw out any of the leaves or stems as well as the tops. Cut those peppers in ½ going lengthwise and then chop them up finely. Put all of the chopped peppers and their seeds into a container and then add ½ cup of white vinegar and 1 ½ cups of hot water. Seal your container and let it sit for about 4 days. Make sure that you give it a gentle shake 2 or 3 times daily. Put a strainer into a funnel and them put the funnel into an empty spray bottle. Pour the tea into the spray bottle while discarding any of the seeds and pepper pieces that collect in your strainer. Add 3 tbsp of vegetable oil and 1 tsp dishwashing liquid to your spray bottle with the tea. Screw the lid tightly on and give the bottle a gentle shake so that the ingredients get mixed. Now, you are ready to spray this in your garden in the mornings. Hopefully, with what you have read here today, you will have the knowledge to get rid of your squirrels and have a gorgeous garden.